Established by Congress in 1916 with the passage of the Organic Act, the National Park Service (NPS) was created, in words attributed to landscape architect Frederick Law Olmsted, Jr., "....to conserve the scenery and the natural and historic objects and the wild life therein and to provide for the enjoyment of the same in such manner and by such means as will leave them unimpaired for the enjoyment of future generations." Over time, the NPS came to be recognized as the nation’s primary agency responsible for protecting and interpreting America’s scenic, historic, and cultural heritage. 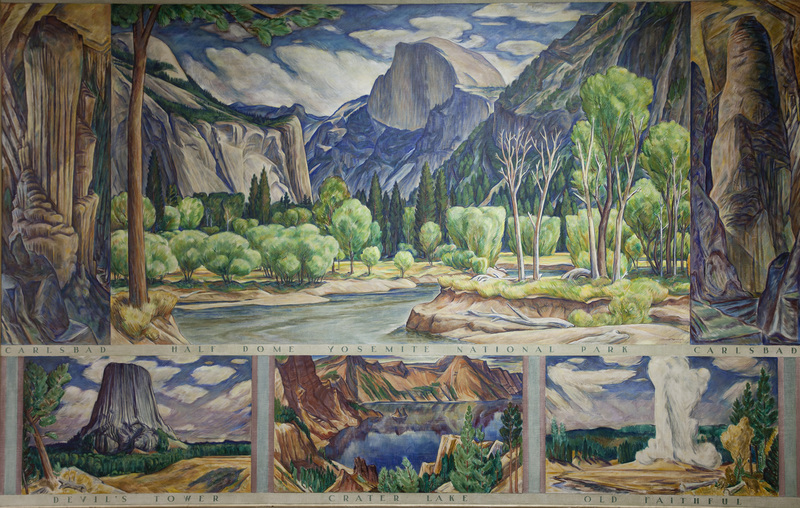 Although the Secretary of the Department of the Interior (established in 1849) had appointed a “general superintendent and landscape gardener” in 1914, early park development hung in a balance between conservation on the one hand and resource exploitation on the other. By the time the Organic Act was passed two years later, some 35 national parks and monuments had been created, each managed independently. Among these were Mount Rainier (WA), Crater Lake (OR), Mesa Verde (CO), Devil’s Tower (WY), and Rocky Mountain (CO). The early years of the NPS were spent establishing management policies that prioritized education, commemoration, and inspiration while downplaying recreation. With the passage of the Organic Act, the individual parks were consolidated and policies were refined—radically transforming the way those properties were managed. 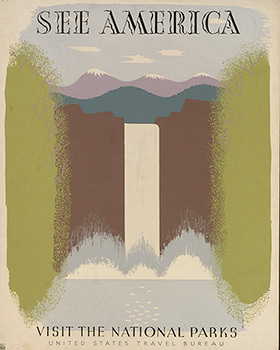 In 1931, a “Park Development Plan” was initiated to coordinate the planning of national parks and monuments. Subsequently, the Landscape Division was established to work with park superintendents to create guidelines for the development and management of roads, trails, tourist facilities, concessions, scenic vistas, and wilderness areas. At the same time, the profession of landscape architecture was maturing, with many academically trained individuals entering the field, some of whom came under the employ of the NPS. 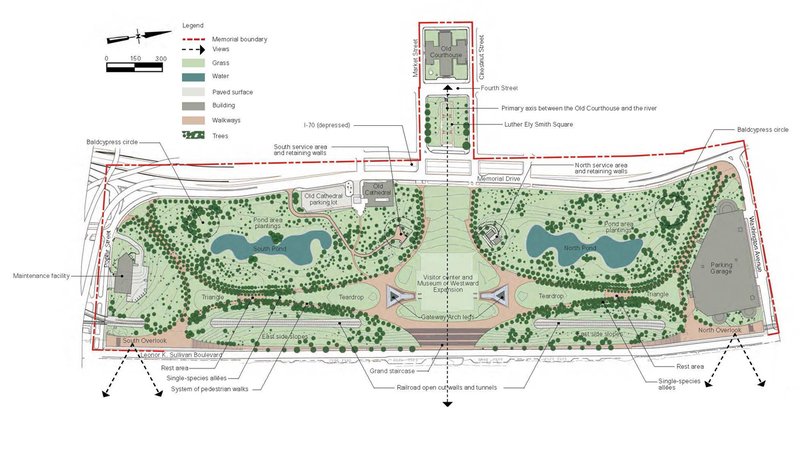 The convergence of several landscape design styles—namely Picturesque, Prairie, and Arts & Crafts—resulted in the evolution of a “Naturalistic or Cohesive” manner of design (popularly known as “Parkitecture”) that came to define many national and state parks. Creating a continuity across the system while also addressing regional character, constructed features such as retaining walls, scenic overlooks, bridges, and trails were made to blend with the natural surroundings. Vernacular styles and local materials were employed to create a “rustic” design ethic in such a way that roads and structures were unobtrusive to the natural landscape. In 1933, the administration of national parks, monuments, and cemeteries, and of public buildings and reservations, was consolidated within the Department of the Interior. Quadrupling the acreage within its purview, the NPS inherited sites formerly controlled by the War Department and the Forest Service. Many of these sites were east of the Mississippi, with 44 of the 52 transferred properties being significant for their roles in American history and culture. Among these were battlefields such as Gettysburg (PA), Vicksburg (MS), and Chalmette (LA) and monuments including the Statue of Liberty (NY), Fort McHenry (MD), and Jamestown (VA). Thus historic preservation and interpretation became as important to the NPS as the conservation of scenic and natural resources. Commencing in 1933 and ending with World War II, New Deal programs such as the Works Progress Administration (WPA), the Public Works Administration (PWA), and the Civilian Conservation Corps (CCC) led to the enhancement of many of the resources managed by the NPS. The Historic American Buildings Survey (HABS)—initiated in 1934 as an agreement between the NPS, the Library of Congress (LoC), and the American Institute of Architects (AIA)—was established to create a publicly accessible record of representative examples of architecture through measured drawings, large-format photographs, and written reports. In 1935, the Historic Sites, Buildings, and Antiquities Act was passed to codify a “national policy to preserve for public use historic sites, buildings, and objects of national significance for the inspiration and benefit of the people of the United States,” marking the beginning of what would become the National Register of Historic Places. By the end of the decade, the NPS was truly becoming a system of national parks. The NPS logo, which features an arrowhead, a sequoia, a mountain range, and a bison, was created in 1954 to be emblematic of the Service’s mission of protecting scenic and historic resources. In the post-War years, visitation to national parks increased dramatically. As tourists in private automobiles increased the pressures placed on parks, the NPS sought to modernize the visitor experience and enhance comfort stations, park headquarters, interpretive centers, and roads—many of which had not been updated since the work of the CCC. In 1955, the NPS initiated “Mission 66,” a nationwide plan that would update park conditions and improve conveniences. With most projects scheduled to be complete by the 50th anniversary of the Organic Act in 1966, the program represented the largest improvement project ever undertaken by the NPS. Landscape architects, architects, and superintendents coordinated the development of visitor centers that consolidated interpretive programs, convenience facilities, and administrative offices in a single structure, often reflecting a convergence of regional and contemporary architectural styles. Mission 66 also resulted in the acquisition of more than 75 national park units, including Fire Island National Seashore (NY), Canyonlands National Park (UT), and the Chesapeake & Ohio Canal National Historical Park (MD, DC, and WV). Program funding also contributed to the completion of major construction projects such as the Blue Ridge Parkway (VA and NC), Natchez Trace Parkway (TN, AL, and MS), and the Gateway Arch at the Jefferson National Expansion Memorial (MO). With the maturation of the NPS marked by its upcoming 50th anniversary, its mission was evolving from the earlier focus of developing its parks as individual units within a system to one that extended conservation and recreation programs beyond the park boundaries and into state and local communities. In 1962, the National Natural Landmarks (NNL) program was established to strengthen the public’s appreciation for natural history by recognizing sites for their exceptional scenery, rarity, and diversity. Three years later, the Land and Water Conservation Fund (LWCF) was created for investment in conservation and recreation projects. With oversight provided by the NPS, the LWCF employed landscape architects in myriad projects directed at urban and underserved communities, resulting in the making of community pools, neighborhood parks, and other amenities. In 1966, the passage of the National Historic Preservation Act led to the creation of the National Register of Historic Places (NRHP) and the National Historic Landmark (NHL) program. In 1969, the Historic American Engineering Record (HAER) was established through a partnership between the NPS, the LoC, and the American Society of Civil Engineers to create a record of significant objects and sites related to engineering, industry, and mechanical technologies. Although the NPS was already involved with the preservation and interpretation of urban sites (notably with its activities at the Jefferson National Expansion Memorial in St. Louis and Independence Mall in Philadelphia) two substantial acquisitions in the 1970s further extended the NPS into metropolitan areas: In the New York City area, the 26,600-acre Gateway National Recreation Area was established, encompassing areas of Brooklyn, Queens, and Staten Island (NY) and Monmouth County (NJ). On the opposite side of the country, the 80,000-acre Golden Gate National Recreation Area was created in San Francisco (CA). In preparation for the Bicentennial of the American Revolution, the NPS established the Boston National Historical Park (MA) and the Longfellow House - Washington's Headquarters National Historic Site (MA). In Pennsylvania, Valley Forge, a site that commemorates an encampment dating to General George Washington’s occupation in 1777, was transferred from state management to federal in 1976. Additionally, the NPS identified twenty parks, monuments, and battlefields for the development of interpretive plans relevant to the Bicentennial. 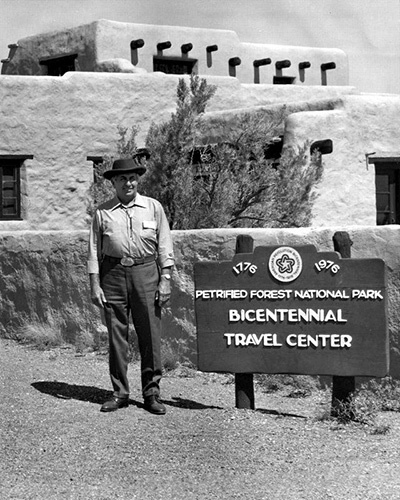 The Bicentennial also served as the impetus for a number of other projects: For example, at the Petrified Forest in Arizona, a structure that was built in 1924 and improved by the CCC between 1937 and 1940 had fallen to neglect. Listed in the National Register of Historic Places in 1975, it was rehabilitated to serve as the park’s Bicentennial Travel Center, opened in 1976. With the preceding decades of park acquisition, design development, and policy writing laying a groundwork, an increased appreciation for the identification, interpretation, and conservation of cultural landscapes could then follow. Beginning in the 1980s, a number of NPS publications were developed to provide instruction on the documentation, preservation, and management of natural, historic, and rural landscapes. Although geographer Carl Sauer had coined the term “cultural landscapes” in 1927 (“Culture is the agent, the natural area is the medium. The cultural landscape the result.”), it wasn’t until 1988 that the phrase was used by the NPS. Management policies created that year identified historic designed landscapes, historic sites, ethnographic landscapes, and vernacular landscapes as cultural landscapes. In 1992, the Guidelines for the Treatment of Historic Landscapes was drafted, establishing standards for the protection and stabilization of landscapes through preservation, rehabilitation, restoration, and reconstruction, and encompassing topography, natural systems, circulation, vegetation, water features, furnishings and objects, views, and spatial organization. NPS publications also outlined methodologies for the development of cultural landscape reports. Additionally, the NPS developed a framework that introduced the concept of traditional cultural properties as eligible for inclusion in the National Register of Historic Places. Mountains, rivers, viewsheds, trails, stands of vegetation, and petroglyphs came to be recognized for their associations with “the cultural practices, traditions, beliefs, lifeways, arts, crafts, or social institutions of a living community.” In 2000, the Historic American Landscape Survey (HALS) was created by the NPS, the LoC, and the American Society of Landscape Architects (ASLA) to systematically document historic landscapes. As the NPS entered the new millennium, it was in a position to reflect on the past and cast an eye to the future. Integrating into its research the work of cultural anthropologists, the NPS expanded its purview into more inclusive interpretation programs to include cultural resources associated with civil rights, gay rights, and women’s rights. In 2015, recognizing that one-third of all NPS sites are located in metropolitan areas, the NPS initiated the Urban Agenda. The program seeks to engage a diverse American public and is guided by three principles: Be relevant to all Americans; bring the NPS parks, programs, and partnerships into alignment; and collaborate internally and externally to serve communities. Ten cities across the country were identified for pilot projects. Of those, Philadelphia, New York, Boston, and Richmond were selected to be the focus of an ongoing collaboration between The Cultural Landscape Foundation and the National Park Service Northeast Region, with the goal of documenting a diverse range of significant landscapes in acknowledgement of the 100th anniversary of the passage of the Organic Act and the creation of the NPS. What’s Out There Guides are produced in partnership with the National Park Service on the 100th anniversary of their founding.